Introduction: We evaluated the spectrum of acquired demyelinating and inflammatory disorders in patients presenting with an acute transverse myelopathy. We also studied differences between an acute idiopathic transverse myelitis and myelitis resulting from other etiologies. Materials and Methods: Eighty consecutive patients with acute transverse myelopathy were included. At inclusion, clinical profile, serum and cerebrospinal fluid parameters, brain and spinal cord magnetic resonance imaging, and visual evoked potentials were obtained. All patients were given methylprednisolone therapy. Patients were followed up for 6 months. Outcome was assessed using modified Barthel index. A modified Barthel index score of ≤12 indicated a poor prognosis. 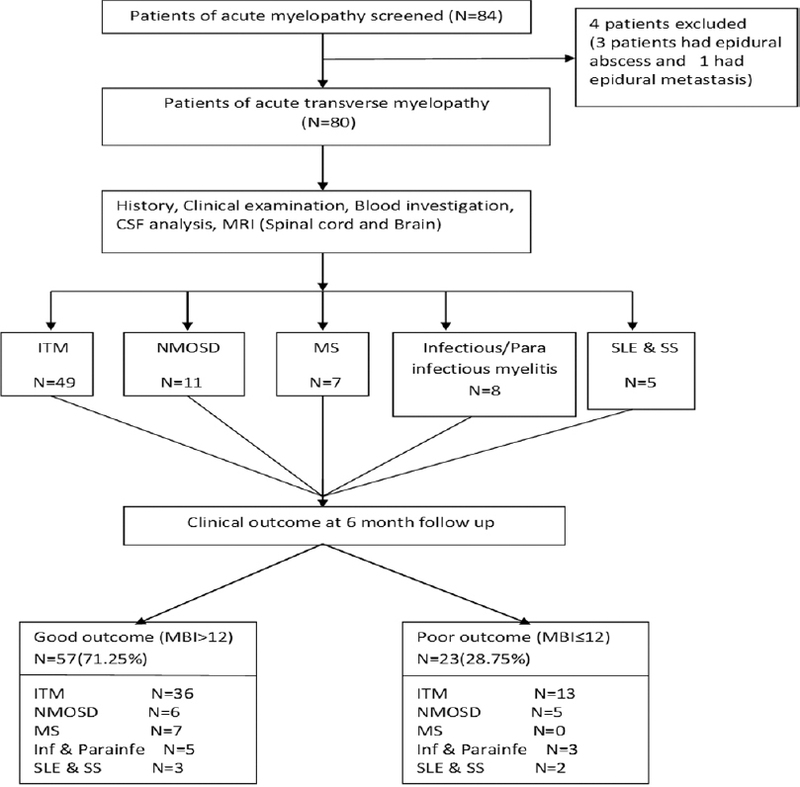 Results: Majority (n = 49; 61.25%) of patients had idiopathic acute transverse myelitis. Eleven cases had neuromyelitis optica spectrum disorders (8 had anti-aquaporin antibody positivity). Multiple sclerosis was diagnosed in 7 cases. Eight cases had infectious or parainfectious myelitis. Longitudinally extensive transverse myelitis was noted in 66 (82.5%) patients. Seventeen patients had abnormalities in the brain. Majority of patients improved following methylprednisolone therapy. On univariate analysis, delay in administering methylprednisolone therapy, poor modified Barthel index at discharge, and extensive cord involvement were associated with severe residual disability. On multivariate analysis, delayed initiation of methylprednisolone was identified as a poor prognostic factor. Conclusion: A variety of inflammatory, infective, demyelinating, and autoimmune disorders present with acute transverse myelopathy. Early institution of methylprednisolone reduces the disability in these patients. The present study evaluates the spectrum of acquired ailments (including inflammatory, infective, demyelinating, and autoimmune disorders) responsible for the occurrence of acute transverse myelopathy. Visual symptoms, brain affliction, and extensive spinal cord involvement indicate a diagnosis other than acute idiopathic transverse myelitis. An early initiation of methylprednisolone therapy helps in resolving the disability. In this study, we evaluated the spectrum of acquired demyelinating and inflammatory disorders. At initial presentation, we tried to establish a differential diagnosis among various causes of acute transverse myelopathies. We evaluated the differences in the clinical spectrum of disorders having short-segment or long-segment transverse myelitis. The clinical, immunological, and radiological factors determining the prognosis were also evaluated. This prospective study was conducted in the Department of Neurology at King George's Medical University Uttar Pradesh, Lucknow, India, between July 2013 and January 2016. The study was approved by the Institutional Ethics Committee. A written informed consent was obtained from patients or their legal guardians. Consecutive patients presenting with acute transverse myelopathy (motor and sensory deficit, sphincteric involvement, and a well-defined upper sensory segmental level) were enrolled. The patients, after their inclusion in the study, were subjected to a cranial and spinal MRI. The MRI protocol included conventional T1-weighted images, T2-weighted images, fluid-attenuated inversion recovery (FLAIR) images, diffusion-weighted images (DWI) with apparent diffusion coefficient (ADC) maps and contrast-enhanced T1-weighted images. In spinal MRI, we noted the number of lesions, their extent, and localization in the sagittal (cervical, dorsal, and lumbar); section while in the axial sections centromedullary versus a peripheral location, cord edema, and the changes visible following gadolinium-contrast administration were noted. Longitudinally, extensive transverse myelitis was diagnosed if a patient had spinal lesions extending ≥ 3 vertebral segments. In cranial MRI, we focussed on the periventricular, cortical, and infratentorial changes. Patients were subjected to a complete hemogram, liver function tests, kidney function tests, serum electrolytes, chest X-ray, urine analysis, and electrocardiogram. Serological tests for hepatitis B, hepatitis C, and human immunodeficiency virus were performed. Patients were also tested for antinuclear antibodies, anti-aquaporin 4 antibodies, and vasculitis (anti-proteinase 3 and anti-myeloperoxidase antibodies). Lumbar puncture was performed in all patients. Cerebrospinal fluid (CSF) was examined for protein, cells, and sugar. CSF specimens were evaluated for herpes simplex virus, varicella zoster virus, cytomegalovirus, Epstein Barr virus, dengue virus, mumps virus, and polymerase chain reaction for tuberculosis. At inclusion, visual evoked potential was performed for every included patient. Patients were treated with intravenous methylprednisolone (20 mg/kg body weight per day; a maximum of 1 g per day) for 5 days. Patients were followed up for 6 months. Disability was assessed using the modified Barthel activities of daily living index, a 20-point scoring system. A good outcome was defined as a modified Barthel index score of >12; and, a poor outcome was defined as a modified Barthel index score of ≤12. A relapse was considered when there was appearance of new symptoms or worsening of an existing symptom along with an objective documentation. It was ensured that clinical worsening occurred in the absence of fever and lasted for at least 24 hours. The diagnosis of idiopathic transverse myelitis was made based on the criteria given by the Transverse Myelitis Consortium Working Group [Table 1]. Statistical analysis was performed using the Statistical Package for the Scoial Sciences (SPSS) software (version 16.0; Chicago, LA). All categorical variables were expressed as percentages, and continuous variables were expressed as mean ± standard deviation. Categorical variables were compared using chi-square test. Mean values were compared using independent-sample t-test. Odds ratio and 95% confidence interval were calculated. Variables found to be significantly associated with a poor outcome were further subjected to binary logistic regression. P values < 0.05 were taken as significant, with all analyses being two-tailed. We included 80 consecutive patients suffering from acute transverse myelopathy. The algorithm and outcomes of the study are depicted in [Figure 1]. The initial clinical, laboratory, and neuroimaging characteristics, and outcome of the included patients are presented in [Table 2]. Majority (49, 61.25%) of the patients had idiopathic acute transverse myelitis. The next major group of disorders was neuromyelitis optica spectrum disorders. Out of 11 (13.75%) cases of neuromyelitis optica spectrum disorders, 8 (86.5%) were anti-aquaporin IgG antibody positive. Multiple sclerosis was diagnosed in 7 (8.75%) cases. Eight cases had either infectious or parainfectious etiology. Among the cases with infectious myelitis, 3 cases had evidence of tuberculosis in the CSF. In 2 patients, a viral etiology was identified (Herpes simplex virus-1 and dengue). Two patients had parainfectious myelitis; one occurred after Herpes zoster and the other occurred after mumps. Three patients had systemic lupus erythematosus whereas 2 patients had Sjögren's syndrome. 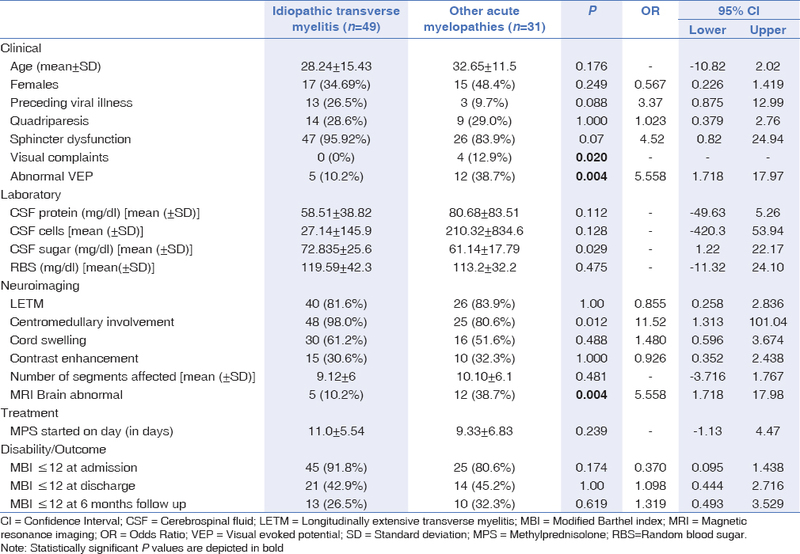 Visual abnormalities (visual complaints and/or an abnormal visual evoked potential) were significantly less frequent in patients with idiopathic acute transverse myelitis compared with other acute myelopathies [Table 2]. Visual complaints were not reported by any patient with idiopathic transverse myelitis; however, it was seen in 12.9% patients with other myelopathies (P = 0.020). On comparing the visual evoked potential parameters in these groups, abnormal visual evoked potential was more common in other varieties of myelopathies (38.7%) compared to idiopathic transverse myelitis [10.2%] (P = 0.004, odd's ratio [OR] = 5.558, 95% confidence interval [CI] 1.718–17.97). Abnormal visual evoked potential was most commonly seen in patients with neuromyelitis optica (P< 0.001). 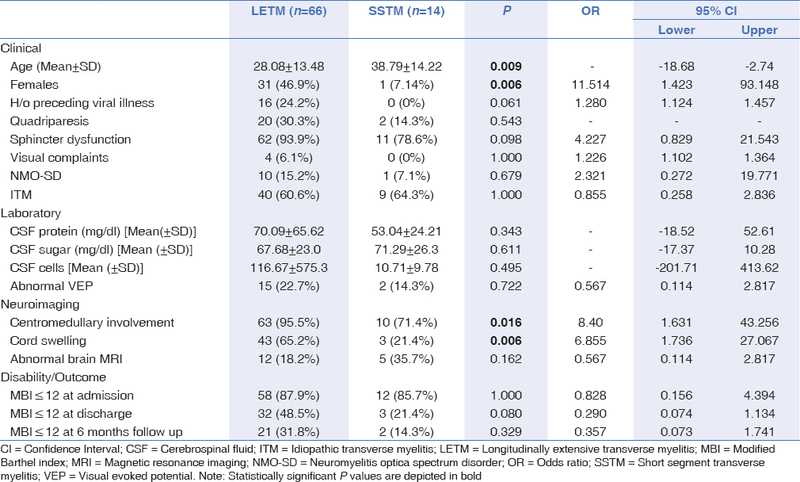 A comparison between clinical, laboratory, and neuroimaging characteristics of longitudinally-extensive transverse myelitis and short-segment myelitis is shown in [Table 3]. Involvement of the spinal cord with longitudinally-extensive myelitis vis-a-vis short-segment myelitis and neuromyelitis optica with aquaporin 4 antibody positivity in individual cases is depicted in [Figure 2] and [Figure 3], respectively. Majority (n = 66, 82.5%) of our patients had longitudinally-extensive transverse myelitis. Eleven patients had cervical myelitis, 32 patients had cervicothoracic myelitis, 24 patients had thoracic myelitis, and 13 patients had whole cord myelitis. Centromedullary involvement was more frequent in the idiopathic transverse myelitis group. 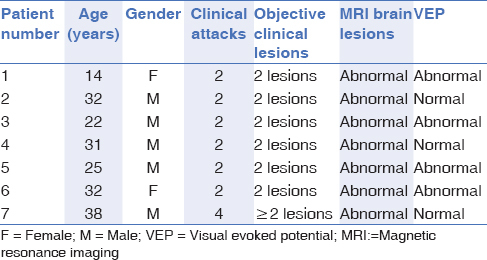 Seventeen patients had an abnormal brain MRI; 7 patients with periventricular changes were later diagnosed as having multiple sclerosis [Table 3]. The most common etiology of longitudinally-extensive transverse myelitis was idiopathic transverse myelitis (40/66, 60.6%). Neuromyelitis optica spectrum disorders (10/66, 15.2%) was the next frequent category. Infectious/parainfectious causes were detected in 10.6% (7/66) of the patients. In 14 patients with short segment myelitis, 9 (64.3%) patients had idiopathic transverse myelitis and 3 (21.4%) had multiple sclerosis. A young age, female gender, centromedullary involvement, and cord swelling on MRI were significantly more common in patients with longitudinally-extensive transverse myelitis [Table 4]. After 6 months, 57 (71.25%) patients had a modified Barthel index score >12 whereas 23 (28.75%) patients had a modified Barthel index score ≤12 (including 7 deaths). On univariate analysis, delayed methylprednisolone therapy (P = 0.001; CI = −7.515 to − 1.980), a poor modified Barthel index at discharge (P< 0.001; CI = 1.844–4.614), higher number of segments involved (P = 0.005; CI = −6.930 to − 1.308), and whole cord involvement (P = 0.039) were factors associated with a poor outcome. On multivariate analysis, delayed methylprednisolone therapy was the lone independent factor associated with a poor outcome. Even though a cutoff of 3 vertebral segments for longitudinally-extensive transverse myelitis is considered, our observations indicate that not all patients demonstrating greater than 3 vertebral segment involvement have a poor outcome. As per our data regarding absolute numbers, a cutoff median value of less than 7 segments and greater than 14 segments (P = 0.007) predicts a good and poor outcome, respectively. Do patients of idiopathic acute transverse myelitis convert to multiple sclerosis? In our series, we noted that during the 6 months of follow-up, approximately 9% of the patients converted to multiple sclerosis. A retrospective review from Spain had noted that 13% (11/87) of patients converted to multiple sclerosis after a median follow-up of 2.9 years. Early-age onset of symptoms was significantly associated with the conversion to multiple sclerosis. In this study, 9.4% of the patients with idiopathic acute transverse myelitis were unable to walk unassisted at the end of the follow-up. Urinary sphincteric dysfunction and longitudinally-extensive transverse myelitis were associated with a poor outcome. It, therefore, becomes pertinent to follow patients with idiopathic transverse myelitis to look for recurrences and define an appropriate diagnosis. In our study, the rate of conversion to multiple sclerosis may increase with a longer follow-up. We noted that the disability status in our patients was not influenced by the type of demyelinating disorder and a majority of patients improved following methylprednisolone therapy. A delayed initiation of methylprednisolone therapy, a significant initial disability, and an extensive cord involvement irrespective of the etiology, were associated with severe residual disability. We argue that patients with extensive cord involvement need more aggressive treatment such as plasmapheresis and/or intravenous immunoglobulins at the outset. The role of immunosuppressive treatment also needs to be investigated. A limitation of our study was that we did not use Spinal Cord Independence Measure scale. It is a comprehensive rating scale that measures the ability of patients with spinal cord lesions to perform everyday tasks. Spinal Cord Independence Measure scale measures the abilities of self-care (feeding, grooming, bathing, and dressing), respiration and sphincter management, and a patient's mobility abilities (bed and indoors/outdoors transfers). We recommend that Spinal Cord Independence Measure should be used along with the modified Barthel Index in future evaluations. In conclusion, a variety of inflammatory, infective, demyelinating, and autoimmune disorders can present with acute transverse myelitis. Visual symptoms, brain involvement, and extensive spinal cord involvement indicate a diagnosis other than acute idiopathic transverse myelitis. Methylprednisolone, early in the course of the disease, helps in improving disability. West TW, Hess C, Cree BA. 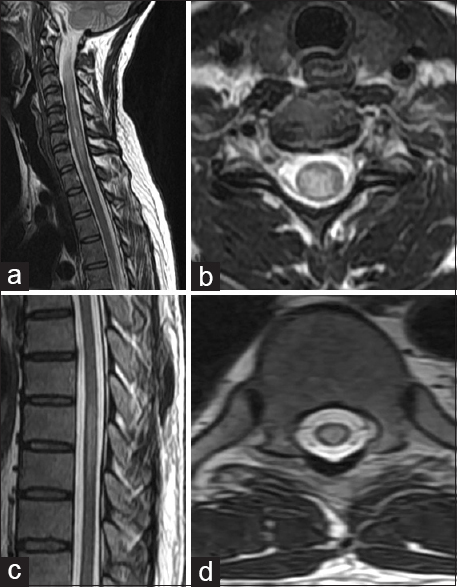 Acute transverse myelitis: Demyelinating, inflammatory, and infectious myelopathies. Semin Neurol 2012;32:97-113. Frohman EM, Wingerchuk DM. Clinical practice. Transverse myelitis. N Engl J Med 2010;363:564-72. Pekcevik Y, Mitchell CH, Mealy MA, Orman G, Lee IH, Newsome SD, et al. Differentiating neuromyelitis optica from other causes of longitudinally extensive transverse myelitis on spinal magnetic resonance imaging. Mult Scler 2016;22:302-11. Jacob A, Weinshenker BG. An approach to the diagnosis of acute transverse myelitis. Semin Neurol 2008;28:105-20. Singhal BS, Advani H. Multiple sclerosis in India: An overview. Ann Indian Acad Neurol 2015;18(Suppl 1):S2-5. Pandit L, Kundapur R. Prevalence and patterns of demyelinating central nervous system disorders in urban Mangalore, South India. Mult Scler 2014;20:1651-3. Collin C, Wade DT, Davies S, Horne V. The Barthel ADL Index: A reliability study. Int Disabil Stud 1988;10:61-3. Polman CH, Reingold SC, Banwell B, Clanet M, Cohen JA, Filippi M, et al. Diagnostic criteria for multiple sclerosis: 2010 revisions to the McDonald criteria. Ann Neurol 2011;69:292-302. Wingerchuk DM, Banwell B, Bennett JL, Cabre P, Carroll W, Chitnis T, et al. 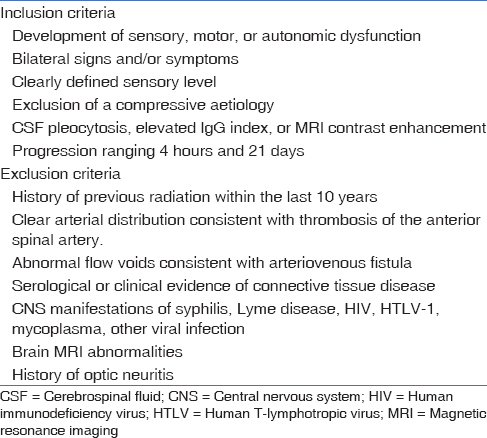 International consensus diagnostic criteria for neuromyelitis optica spectrum disorders. Neurology 2015;85:177-89. Hochberg MC. Updating the American College of Rheumatology revised criteria for the classification of systemic lupus erythematosus. Arthritis Rheum 1997;40:1725. Vitali C, Bombardieri S, Jonsson R, Moutsopoulos HM, Alexander EL, Carsons SE, et al. Classification criteria for Sjögren's syndrome: A revised version of the European criteria proposed by the American-European Consensus Group. Ann Rheum Dis 2002;61:554-8. Kim HJ, Paul F, Lana-Peixoto MA, Tenembaum S, Asgari N, Palace J, et al. 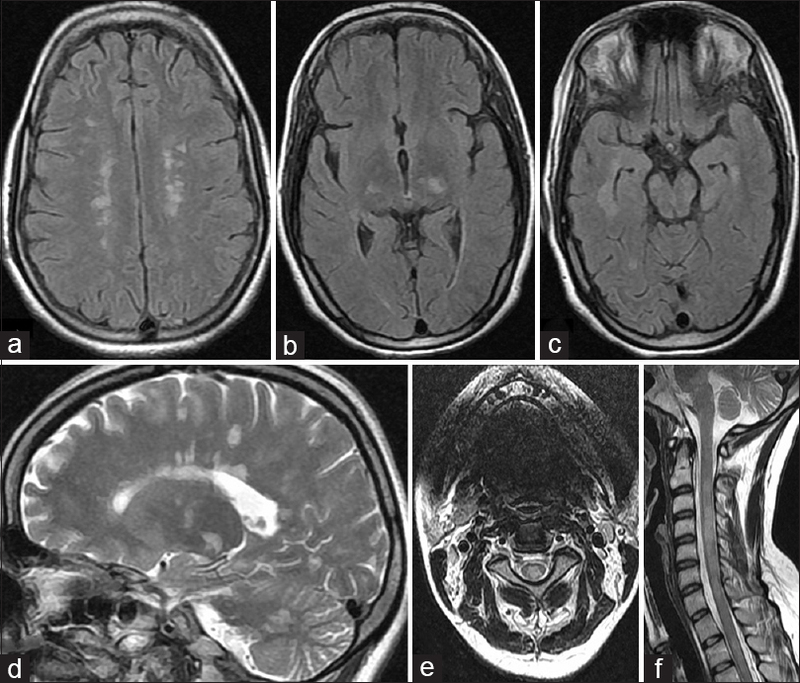 MRI characteristics of neuromyelitis optica spectrum disorder: An international update. Neurology 2015;84:1165-73. Tackley G, Kuker W, Palace J. Magnetic resonance imaging in neuromyelitis optica. Mult Scler 2014; 20:1153-64. Cobo Calvo A, Mañé Martínez MA, Alentorn-Palau A, Bruna Escuer J, Romero Pinel L, Martínez-Yélamos S. Idiopathic acute transverse myelitis: Outcome and conversion to multiple sclerosis in a large series. BMC Neurol 2013;13:135. Bevan CJ, Cree BA. Fulminant demyelinating diseases of the central nervous system. Semin Neurol 2015;35:656-66. Catz A, Itzkovich M, Agranov E, Ring H, Tamir A. SCIM-spinal cord independence measure: A new disability scale for patients with spinal cord lesions. Spinal Cord 1997;35:850-6.